Hydrothermal vents are openings in the Earth's crust out of which minerals and hot water erupt. Animals gather around these vents, which are sources of warmth and nutrients in the cold, black ocean depths. More than 500 new species have been identified since the first vent was discovered in 1977, and researchers expect to discover many more in years to come. Microorganisms are the first life forms to flourish at a hydrothermal vent. They also make up the base of the food chain. The birth of life at a hydrothermal vent often begins with a burst of bacteria from the opening. Vent bacteria can withstand higher temperatures than any other organism. Instead of light-based life, life at hydrothermal vents is based on sulfides that the bacteria can convert into energy. 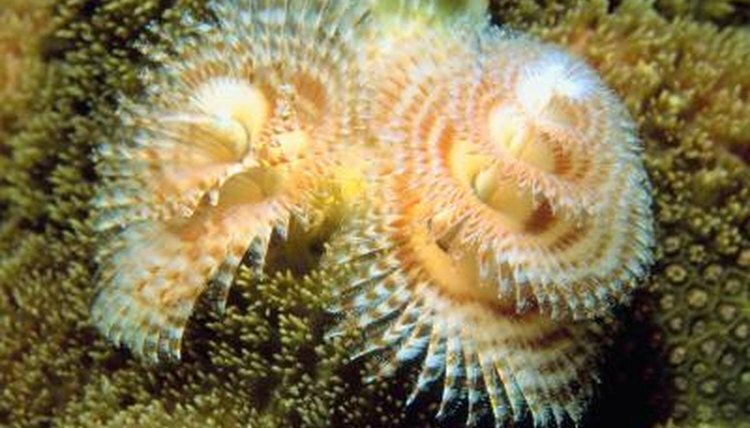 For example, tube worms feed exclusively on bacteria; in fact, they don't have digestive systems. They are basically living bacterial culture containers. Ranging from a few inches long to several feet, hydrothermal worms vary greatly in body plan and coloration. Some worms are sessile, like the giant tube worms, while others swim and still more creep across the ocean floor and over vent columns. Able to grow 33 inches per year, sessile giant tube worms in the Pacific Ocean have been classified as the fastest growing invertebrates in the ocean. Benthic scale worms (Polychaeta polynoidae) look like they're covered in layers of thin, fuschia-colored disks. Pompeii worms (Alvinella pompejana) are swimmers, named after the volcano because they're able to withstand temperatures as high as 175 degrees Fahrenheit. Eel-like fish with bulbous heads sit at the top of the hydrothermal food chain. Fish in the genus Thermarces, called eelpouts, mainly feed on crustaceans like amphipods and crabs. They're slow, lazy swimmers, snaking their way through tube worm colonies. Three species have been identified in this genus so far. Thermarces andersoni and Thermarces cerberus live in the Pacific Ocean and Thermarces pelophilum lives around hydrothermal vents that spring up along the Mid-Atlantic Ridge. Eelpouts reach 8 to 8 1/2 inches in length. Mussels (Bathymodiolus), limpets (genera Lepetodrilus and Eulepetopsis), clams (Vescomyidae) and barnacles (Neolepas) populate hydrothermal vents. Nearly all of them have white or translucent shells and rely on symbiotic bacteria to help them get nutrients. Foot-long clams inhabit hydrothermal vents in the Pacific. The rarely seen hydrothermal octopus (Vulcanoctopus hydrothermalis) lives under colonies of sessile mollusks and feeds on them. These creatures are white, like many other hydrothermal animals, and grow to about 3 feet long, with heads the size of an orange. Some species of shrimp, lobsters, crabs and amphipods are specialized to withstand the normally unwelcoming conditions surrounding hydrothermal vents. Large colonies of white crabs (Bythograea thermydron) are common sights here. Eyeless shrimp (genus Rimicaris), found only at vents in the Atlantic Ocean, have sensitive spots on their heads used to detect heat. Miniature and squat lobsters (families Munididae and Galatheidae) prey on worms and other small animals surrounding vents. The clear-bodied amphipod Ventiella sulfuris lives in swarms, while the amphipod genus Eusiridae, found only at hydrothermal vents, contains 59 species.